Matt Adamson fronts a protest in Sydney over Australian job losses. FORMER State of Origin footballer Matt Adamson looks tough as he fronts a protest over Australian job losses in Sydney. But the Palmer United Party NSW Senate candidate melts as he gets a text message from his wife to tell him that she's just been cleared of Multiple Sclerosis. The forward has taken plenty of knocks in his 16 years playing professional rugby league. 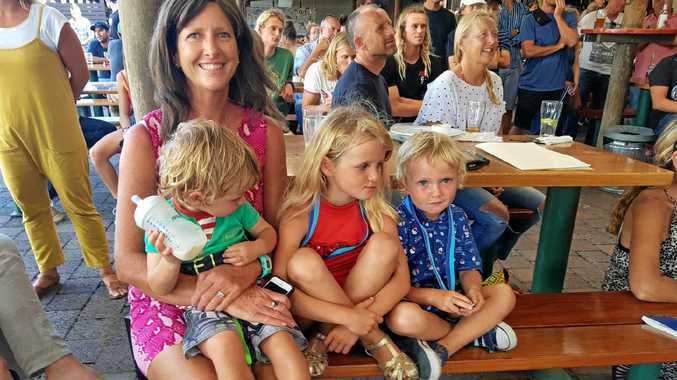 But none as heavy as the three health dramas that have hit his family - the last two of which came as he agreed to a call up from billionaire Clive Palmer to lead his NSW Senate team. Mr Adamson's first scare came five years ago when his daughter Charlotte was diagnosed with alopecia areata - a condition which results in the loss of hair on the scalp and elsewhere on the body. Adamson and his wife launched the Princess Charlotte Alopecia Program (PCAP) in 2008 to encourage people to donate their hair. Then two months ago, his other daughter Emily had to go in for a 12 hour heart operation. His wife Rebecca was also hit with the news that she may have MS around the same time. Mr Adamson, who has been married for more than 15 years, admits his guilt as he is not there for his wife. "I am a great believer in fate and I believe that everyone has their own calling in life. "If my calling is to be a Senator and represent my state, like I did in rugby league, it will come on election day. "I will leave no stone unturned. It is a unique opportunity, not only for me but for all Australians to have a unique opportunity. The footballer was the standout performer at the Palmer United Party campaign launch on the Sunshine Coast. He's a big believer in the passion and direction of Clive Palmer. "I'm a pretty passionate bloke and I think that is what attracted me to Clive. "I like people who are straight shooters and say where they stand and say what issues they stand for,'' he says. "I felt Australia needed someone like that for our country, a new vision. I feel we are stuck in a rut of vision and that is what inspired me about Clive. "I had never met him in my life and four days later he rang me and said "Matty would you head up my senate ticket?" And I said Clive I don't know a great deal about politics, even though the Liberal Party have been trying to court me for a couple of years. "And he said "Good you've got a job.''" Mr Adamson said Mr Palmer's work ethic was phenomenal. "I mean I will get text messages at 2am in the morning, 3am, 4am, and I still don't know to this day what Clive's sleep pattern is. "Whether he sleeps between 10 and 2 or what it is, it is just phenomenal mate and he takes it all on because he has such a big heart and such emotion for our country. "For a big chunk of loveable, jovial Australians - and that is what we are - I think they will be attracted to Clive's type of personality. "The other people who don't see that will hopefully understand his smarts. "Clive openly admits that he has failed in life but he never lets that failure get in the way of his next success. "I played Rugby League against a bloke called Darren Lockyer and he was probably one of the worst defenders in his position that I have ever seen but it never fazed him. "He would miss tackle after tackle, but for the five he missed he would set ten up and that is the sign of a true champion. "That is why people respected Darren Lockyer and I believe that is why people respect Clive Palmer. "He said to me from day one "A sports person understands that you've gotta be accountable, you've gotta be responsible, you've gotta be committed, and you've gotta have a real hard work ethic." "I think that is what he is trying to drive within the party. "He is looking for small business owners and anyone who has a moral value or a work ethic to drive the productivity of our country. "So rather than a political party line that is all focused on words, we have a little motto within the party "less talk, more action." Clive Palmer: What's the big man really like?